As a housewife, I clean my floor several times a week. It is not a difficult job but I just wish to get it done quickly. From my experience, it is much easier to clean the floor with floor cleaners. I have kids and pets at home and I have tried some brands of chemical and natural floor cleaners. Generally speaking, chemical cleaners are with better cleaning power but natural cleaners are safer for kids and pets. For both types, there are several brands that are good and worth recommending. The first one I wish to recommend is Clorox Ready Mop Advanced Floor Cleaner. Clorox is a popular brand for cleaners and it certainly gives confidence to consumers. Honestly, this cleaner works well in dissolving dirt and grease. Besides, it has strong sanitizing power for killing over 90 percent of common household bacteria and therefore is best to use on kitchen and bathroom floor. 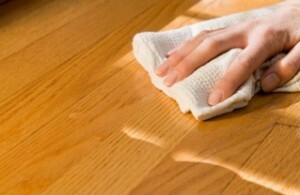 Though I recommend for kitchen and bathroom use, it is safe for wood floor. Mop & Glo Triple Action Floor Shine Cleaner is the other one that I think is good. Unlike most floor cleaners available in the market, it servers three functions at a time. It cleans, polishes and protects my floor in just one step. The protection power (against scratches) is long lasting. Therefore it is highly recommended for high traffic areas. The only drawback of this product is its smell. My husband dislikes the smell. Swiffer provides a wide range of floor cleaning products and they are not expensive compared to other brands. Its WetJet Multi-Purpose Cleaner can be used on hardwood, ceramic and tile surfaces. It is easy to use and the smell is nice (especially compared to Mop & Glo). But, you may have heard about the rumor on its harmfulness on pets and kids. I am not really sure about the harmfulness but I did not experience any problems when using it. Recently, I am keen on cleaning products with natural formula as they are definitely safer to my kids. I do not wish my kids to have allergies and asthma because the using of chemical cleaning products. If you have kids at home as well, you may give a try to BabyGani Floors to Adore. It is so gentle to my kids. It leaves no toxic and chemical residues and is fragrance free. It is also suitable for carpet machines, but I have not tried it out. Finally, if you have pets and you do not wish your pets to be harmed by chemical floor cleaners as they walk and crawl on the floor, PetGanics is a good choice for you. I am not sure if it is 100 percent made with natural ingredients but it is largely made with natural ingredients at least. The main cleaning agents are derived from soybeans and palm kernel oils. The fragrance is also derived from natural lavender essential oil instead of artificial chemicals.